“Christopher Columbus had a pocketful of beans.” This engaging imagery bridged our two Context Travel Barcelona tours: Gothic Quarter and City of Chocolate. 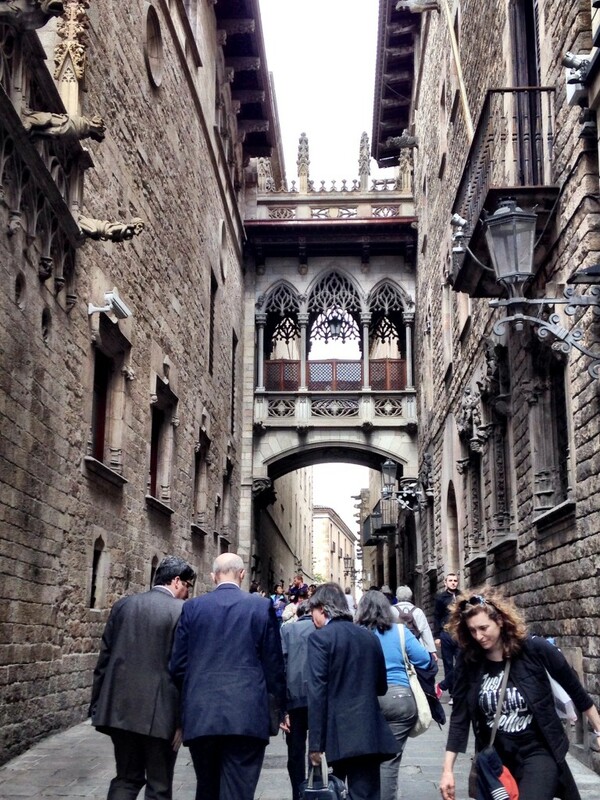 Arriving in a city we’d never visited, we welcomed the opportunity to acclimate ourselves by taking two Context Travel Barcelona tours: City of Chocolate and Gothic Quarter. Little did we realize a single engaging story would bridge and overlap these two seemingly unrelated approaches to educating and entertaining us with Barcelona’s fascinating history and tasty legacy. Christopher Columbus, whose ancestry is claimed by Catalunya in an ongoing dispute with Italy, Portugal and other parts of Spain, had returned to Barcelona rather triumphantly from the New World. Commissioned by the Crown of Aragon (in the personages of Ferdinand and Isabella) to explore new routes to India and lay claim to any discoveries in its name, he was back with a number of treasures – live turkeys, pineapples, tobacco, woven hammocks, and almost as an afterthought, a handful of cacao beans. Without old Chris, there wouldn’t be this! The story goes that Columbus awaited his audience with the Sovereigns in the courtyard where we were standing in Barcelona’s Gothic Quarter. 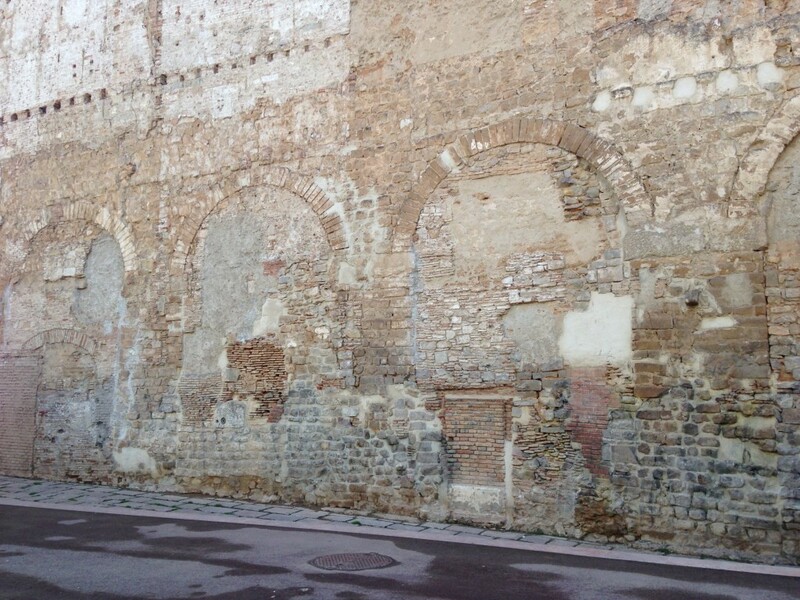 While our Context Travel Barcelona guide pointed out architectural clues as to what had occurred over the centuries as the buildings were repurposed, I daydreamed. Columbus hadn’t been particularly lucky during his explorations: one of his ships had sunk, he’d failed in his original mission, there were huge navigational mistakes during the voyage, and he’d narrowly escaped mutiny. He must have been pretty nervous, I thought, in the moments before they called him in. Perhaps he was wondering whether he could live up to the self-congratulatory hype in the letter announcing his arrival which had precipitated this meeting? 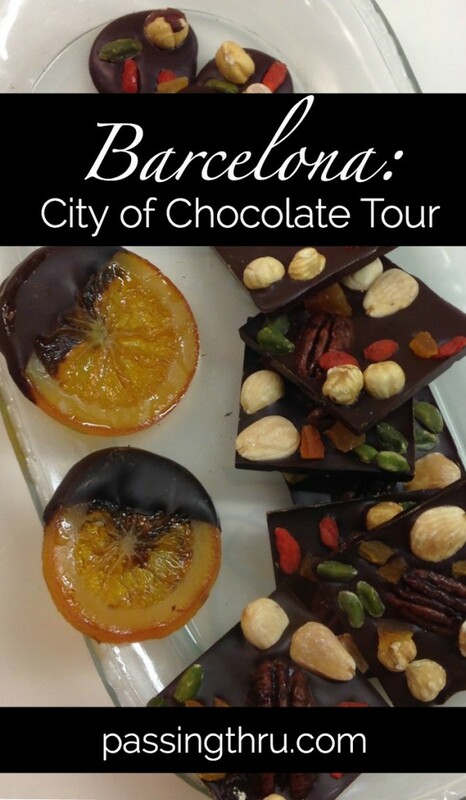 Later the same day, on our second tour with Context Travel Barcelona – the City of Chocolate tour – we heard more. Columbus hadn’t a clue what his pocketful of beans was for. While he observed that they were used to make a drink popular in the New World, its bitter taste was unappealing in the Old. Not until about a hundred years later would drinking sweetened chocolate become palatable with courtiers and nobles. And a hundred more would pass before mere mortals, like us, would be granted access to the deliciousness. Context Travel Barcelona provided us with passionate docents, Sonia and Esther, who were enthusiastic experts in architecture and chocolate, respectively. As we walked pre-arranged routes, Sonia and Esther deftly acquainted us with the subject matter by using a variety of senses. 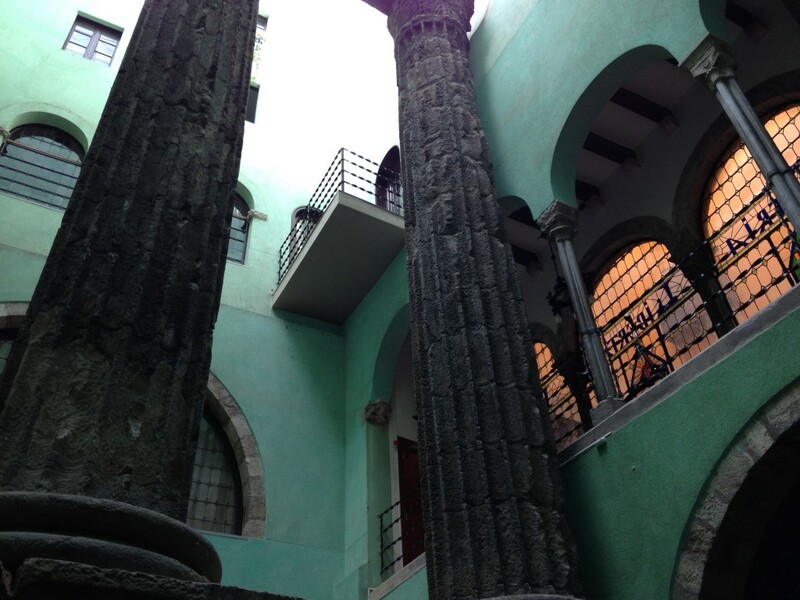 With our eyes, we observed Roman, medieval and modern architectural elements juxtaposed together. We learned to spot the faux Gothic. These were 19th-century attempts at “Disney-fication” in the Quarter, which sought to prettify things ahead of Barcelona’s Universal Exposition in 1888. How faux can you go? A 19th-century bridge between two original Gothic buildings. Your clue? It’s too perfect. With our ears, we heard the stories of incredible feats of Medieval engineering. We were told about the Guilds of tradesmen and artisans, of Christians and Jews keeping their own communities, of politicians and merchants who built the city’s fabled wealth. To our noses came fragrant aromas in the narrow streets of the Quarter and the boulevards of the newer Eixample part of the city. With our fingertips, we traced the textures of history. And oh, did we ever taste. Cups of rich, hot chocolate devoured with whipped cream by the spoonful. 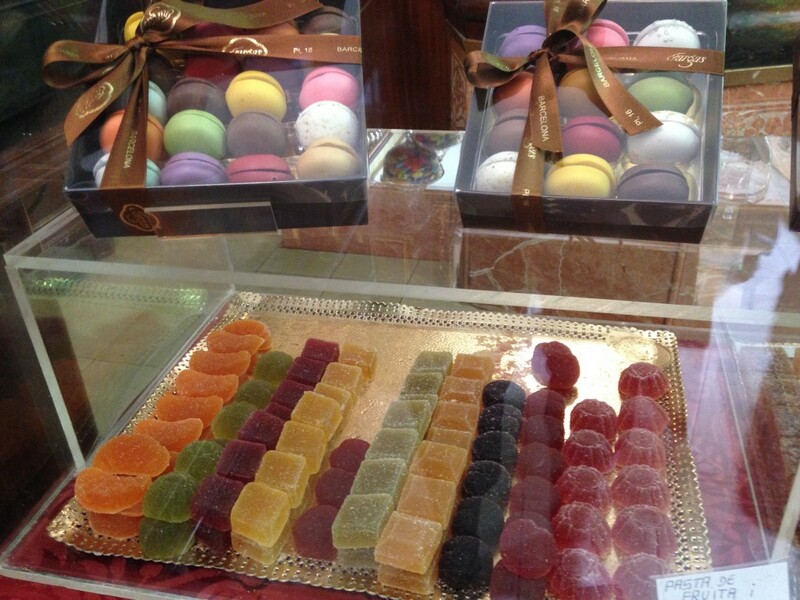 Flavored confections and sculpted sugary fruits. Chocolate married with floral flavors, salty notes and unexpected spices. By the end of our day with Context Travel Barcelona, we were satiated. 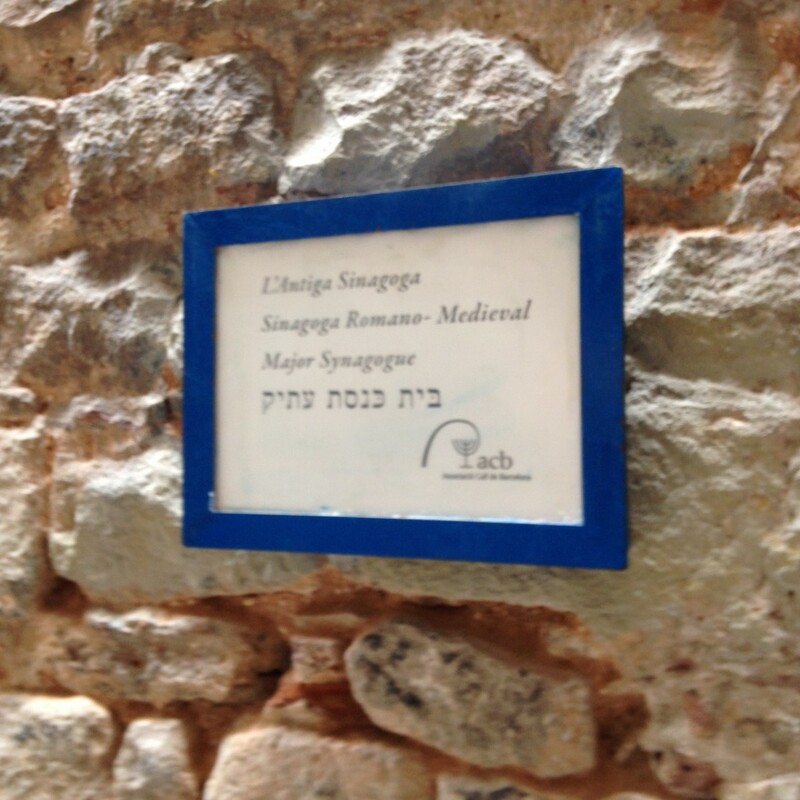 We had been given an in-depth look at the city’s layers of heritage from ancient times until today. This valuable perspective would affect the rest of our impressions of Barcelona during our stay. We had tasted almost too much chocolate, never dreaming this could even be a possibility, loving it as we do! And we will always remember the story of Christopher Columbus, nervously waiting to be called into the Court of Aragon, with a pocket full of New World beans. Context Travel’s vision is to “bring together local specialists with curious travelers to educate and impassion them; to allow them access to places and cultures that might otherwise remain out of sight to the casual visitor; to invite them off the tourist track and into the real life of the people, history and culture that makes these capitals, destinations.” Context provides specialty tours in more than 30 cities and four continents. Context Travel Barcelona offers private guides and small group walking tours for those who are seeking in-depth experiences in history, gastronomy, art, architecture and other cultural aspects. No more than 6 guests per tour. Prices begin at just over 80€ per person for small groups, just over 345€ for private guides. Tours last around 3 hours, and some include more walking than you may be used to; wear comfortable shoes! We’ve taken Context Tours all over the world. They are wonderful and highly recommended. Learn More. Note: We were guests of Context Travel Barcelona in conjunction with TBEX for these two tours. All opinions are our own. The photo of you and Pete kissing is so great! You guys really know how to have a good time. And of course in Barcelona — one of my favorite places on Earth — how could you not have a wonderful time? Conrad was sitting next to me and I read out loud to him the part about the faux-Gothic. He got a real kick out of it. 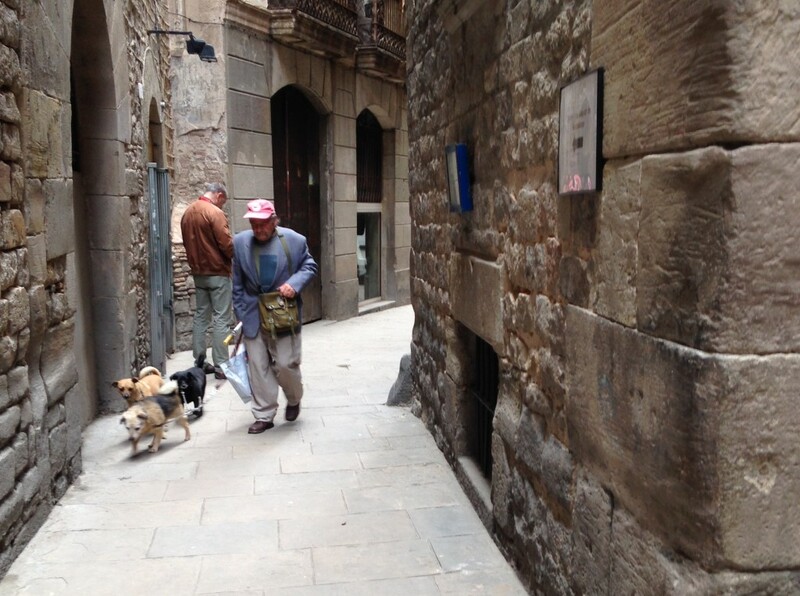 Hi Josie – It was really fun walking all over Barcelona. Context Travel’s guides were so engaging, we fell in love with the city in these first few bites. Thank you for this post. You showed me a side of Barcelona I had not heard of before. 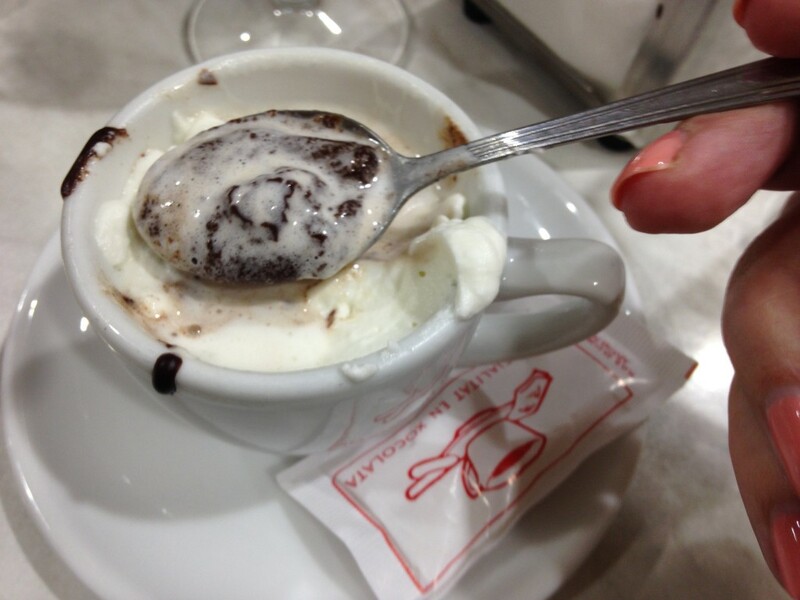 It is interesting that I have actually been reading quite a bit about chocolate tours in Barcelona. I just would not imagine that is the place for such a thing, but apparently I am wrong! Hi Claudia – We were surprised, too. We thought chocolate and we thought Switzerland or Belgium, but now we think Barcelona! Great post! I too did the City of Chocolate Tour with Context Travel and was really impressed with their style of conducting the tours. Esther is lovely and so knowledgeable. And the chocolate is quite fantastic too! Hi Natasha – We just loved Esther, too. She was so enthusiastic and passionate. Looks like you had a great time in my home city! 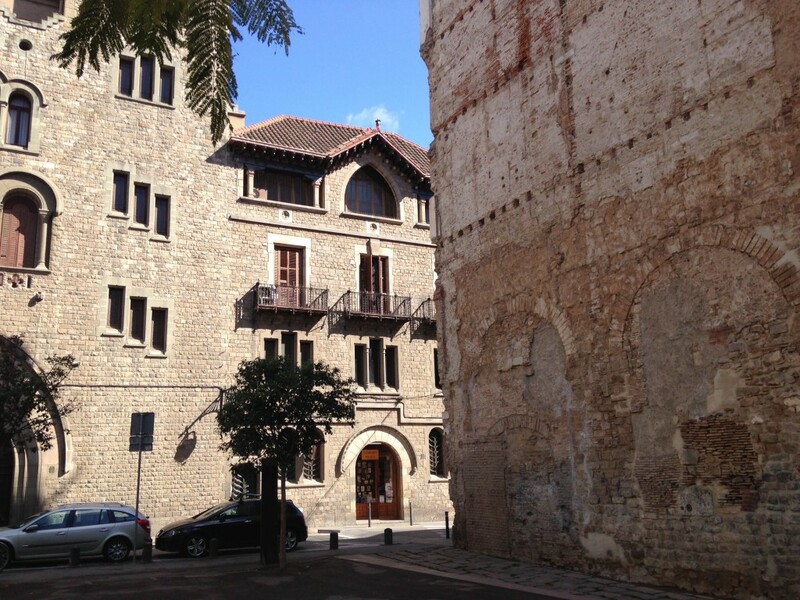 The one place I recommend to visitors in Barcelona is the Gothic Quartier. It’s unique, it’s charming and it’s one of the places you can feel is authentic in a city with such massive tourism industry. Hi Bruno – I agree. We’ve read the concerns about tourism overwhelm, and I am glad we were there too early for most of them. It’s not hard to understand why Barcelona is so popular with visitors, though. It’s amazing. Learning how close we came to not having chocolate just sends shivers down my spine 🙂 Well done Mr Columbus indeed! Sounds like my kinda tour, always enjoy seeing a city from a different perspective, thanks for sharing your tasty tale. Hi Heather – Yes, I know! I can’t imagine a world without chocolate! Hi Suze – Context Travel Barcelona has several historical tours, but in my opinion, starting in the Gothic Quarter was perfect for us. We were quickly brought up to speed on the history and went on to recognize architectural signs throughout the Costa Brava during the rest of our time in Spain. Anyway, I’m fixated on the candied orange with chocolate. Can’t stop looking at it and drooling. Hi Ana – Hahaha! I’m not getting in the middle of any disputes on this subject. 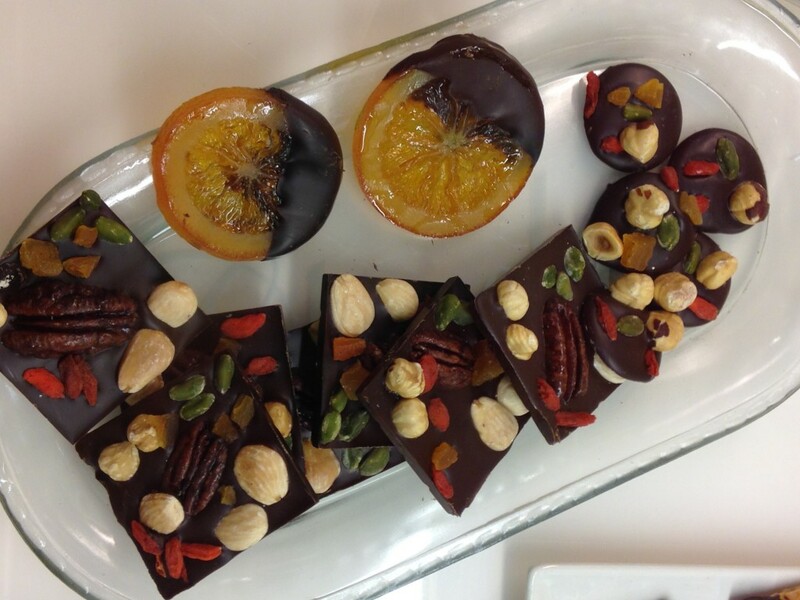 🙂 You can get that candied orange (and other simply indescribable goodies) at Escribà, who is probably the most prominent modern chocolatier in Barcelona. They do amazing work. How interesting! My stay in Barcelona was far too brief to explore any of the city’s history, so I’d love to go back and learn more! Hi Kirstie – I hear you. We’ve had to slow way down. We could only spend a total of five days in Barcelona (and they sandwiched other locations) and it wasn’t nearly enough. We’ll return. Amazing insight in to Barcelona. Its been a while since i last visited but one element that has always remained with me is the fantastic architecture. My partner is a chocoholic, so i think the mere mention of a chocolate tour will speed up our return to this beautiful city. Hi Matt – There is nothing quite like Barcelona if you’re an architecture buff. I felt like I could take dozens of photos every few steps! You both would love these tours. Wonderful read! I love Barcelona and have a huge interest in finding out more about it but unfortunately have never managed to really explore, even though I’ve been twice! I’ll definitely take one of these tours if I ever get the chance to go back so thanks for the tip. Hi Danniele – You’re so welcome. We enthusiastically recommend Context Travel; they do an outstanding job. Hi Will – We can’t either! Hi Sarah – They really are a great way to get you up to speed in a new destination, or provide a more in-depth look at one you already know. We have not been to Spain as yet. However, it will be some time soon. There are so many things you read about doing in Spain and we really don’t know where to start. Now, however, we have our first item on the list. We both love chocolate and I love architecture. The Context Travel Barcelona tour is ideal during our first visit to Spain. Hi Travel2ofus – Wonderful! You will not regret it! Just a note that these were actually two separate tours – the Gothic Quarter and the City of Chocolate. It was a very full day for us. If we had to do it again, we’d do them on separate days. Great story woven through the tour!! We’ll definitely be on the lookout for faux gothic when we get there!! And lots of chocolate? That definitely sounds like one tour that shouldn’t be missed! Hi Carolann and Macrae – They’re both awesome tours. And while there was a bit of overlap, we felt that was a plus. Hi Mia – Hahaha, we think not, too! We would love to return to Barcelona. Great post, and delicious looking chocolates. Hi Natalie – It’s definitely in our Top Ten, and maybe Top Five Favorite Cities in the world. Oooooh I would LOVE to take a chocolate tour of Barcelona – what a fun and fab way to explore the city. I do love that themed tours like these double as a history lesson as well – because it’s great to explore the city on foot by yourself and marvel at the different architecture, but you get a completely different perspective when you know the history. Thanks for this – will definitely be taking a context travel tour when we hit up Spain! Hi Meg – We agree. Sometimes people are reluctant to tour for various reasons. We’ve found we really enjoy the perspective a quality guide can bring. I don’t think we’d like the larger groups as much as we enjoy the intimacy of a small group such as Context provides. Of course, it’s always best if you have the guide to yourself (and we’ve loved that ), but this is pretty close. Let us know how you get on with your visit. You can never go wrong with Barcelona! Enjoyed our stay here. Hi Megsy – I agree. It’s an amazing city. Mmmm – chocolate and history – what a great combination. And there was I walking around the Gothic area thinking that it was all real……I should have take a Context Tour! The chocolate tour sounds great too! Hi Jenny – Well, a great part of it is! But it was fascinating to learn that they moved buildings and cleaned things up a lot in the 19th century in order to put on their best face! Faux Gothic is a real bug bear for Gordon. It bothers him that they saw the need to window dress a perfectly good building. I love walking tours with passionate locals. You get to learn so much from, as you say, passionate people. 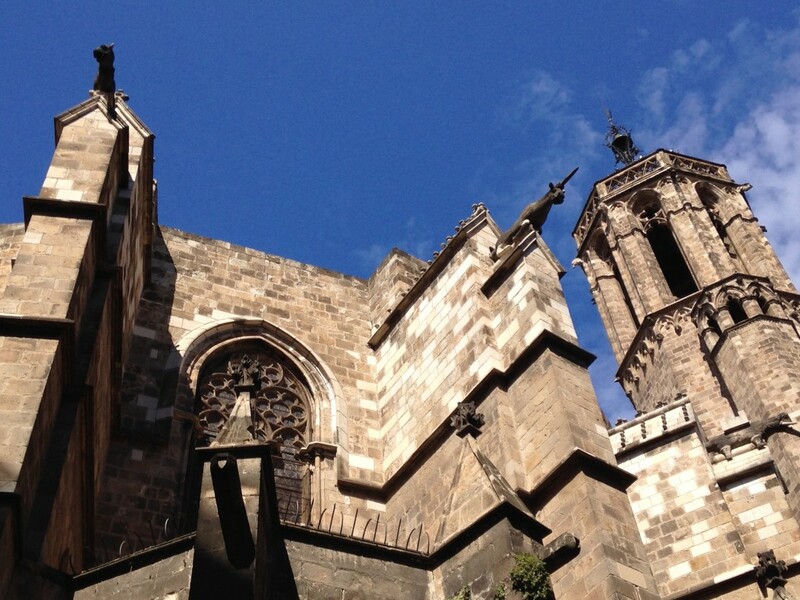 I took a Context Tour of Gothic Barcelona as well, with a different guide, and it was excellent! I love their knowledgeable tour guides. Reading this, though, I wish I’d taking the chocolate tour! The idea that chocolate might not have made it to Europe: no Belgian or Swiss or Dutch or French chocolate? Could I live without it? I’m not sure… and I’m only slightly exaggerating! You got me when you mentioned Chocolate. Thank God for Christopher Columbus and his pocketful of beans! I don’t often take tours, preferring to wander and stumble on interesting things, but these Context Tours sound like they are well-organised and provide expert information. Hi Yasha – We’d rather have root canals than go on one of those larger tours where you need a headset just to hear the guide. No thanks. But we changed our tune about tours in general when we hired private guides in Gettysburg, and in Normandy. We had such enthusiastic experts both times that it made for an unforgettable experience. These two tours with Context Travel were similar. The group was small, the guides were in love with their subject (an easy task for chocolate), and they knew the city in and out. You’d enjoy this experience even if you’re not a “tour person.” And yes, thanks be to old Christopher and the beans! Hi Noel – Your instincts were correct! Now that we know what to look for, the contrast seems dramatic. Fascinating post. Context Tours sounds great. It’s so cool how your two tours intersected. 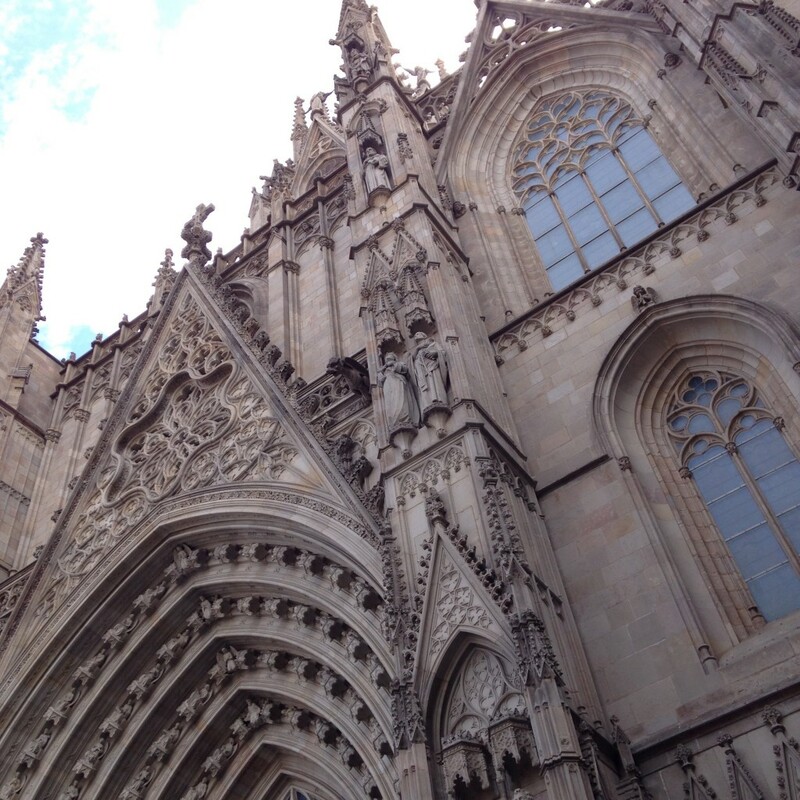 I loved walking through the Gothic area when I was in Barcelona and your photos are wonderful. Hi Donna – Yes, we were surprised to start the second tour in the same square we’d been in an hour or so before. Context Travel is a great company, and we’ll be looking to see if they offer tours wherever we are from now on. Both the chocolate and Gothic tours sound great. We enjoy taking tours like this at the beginning of a visit to a new city, to give context to all the sights. Hi Shelley – I think it’s a smart idea. We like the hop-on hop-off busses, but a walking tour with Context is really a more in-depth experience. I really want to get to Barcelona- one reason is the Gaudy architecture- you’ve given me two more. Would love to explore the old Gothic architecture as well as chocolate. We have a shop in Santa Fe that specializes in Old and New World chocolate elixirs. Got me interested in the history of cacao. I think I was 19 or 20 the last time I was in Barcelona. It is high on my return to list. Love both of these tours, and your photography really brings them to life. Hi Nancie – We want to return to Barcelona, too. The city feels like an old friend. The last time I was in Barcelona I walked through the Gothic Quarter with the parents of a family I was doing a home exchange with in Calella de Palafrugell. They were a couple well into their 70s and bickered the whole time. When it’s someone else’s parents it’s hilarious and I think I failed to take in a lot of the Gothic Quarter so thanks for filling in the gaps in my experience there! Hi Kay – Ha, the Bickersons! So distracting! Great post with some lovely pictures! Thanks for sharing! Hi Sanjana – Thank you. You had me at chocolate. I love Barcelona as well. My daughter and I sat and drank hot liquid chocolate at a cafe on Las Ramblas and I still can taste it. I love the way you always intertwine history with your present day adventures! Hi Suzanne – Thanks! We knew we needed to take these tours the minute we saw their listings. That both of them wove the same story into their subject matter made our experience come alive. It’s always so amazing to read about your exploits. It is even more amazing how you choose what you will experience and how you weave the stories after the tours! Bravo! How did I miss that chocolate tour?! Barcelona is one of my favorite cities but we definitely weren’t there long enough. I’d love to go back and take those tours and learn more about the city’s fascinating history. Thanks for letting me go virtually with you! Hi Lois – We’re big fans of Context Travel for that very reason. They seem to offer a little bit of extra that goes a long way toward enjoyment and understanding. 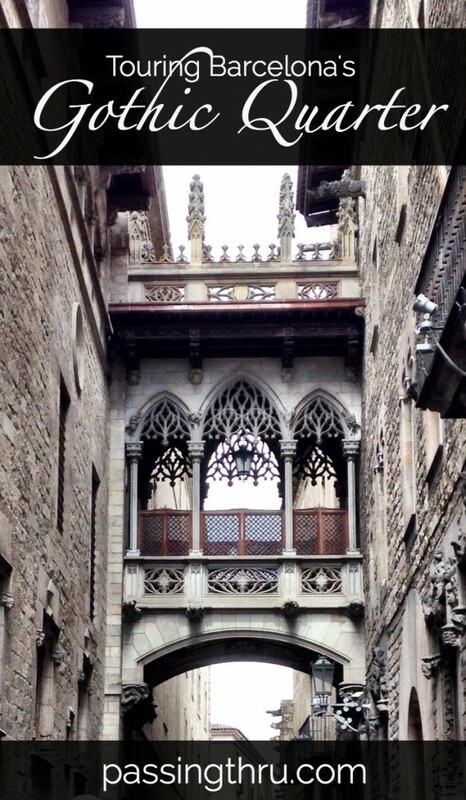 Hands down, the Gothic quarter is my very favorite part of Barcelona. It sounds like your Context Travel Tours were terrific! Hi Irene – They really were. We fell in love with Barcelona and it’s in no small part to the excellent introduction we had with the tours we took. The great thing about walking tours like that is that they show you things you wouldn’t have found for yourself. I certainly hadn’t made the connection between Columbus and chocolate before. I just adore Barcelona and your tour sounds wonderful. I’m wondering if you visited the Museu de la Xocolata. We did a few years back and it was a hoot. 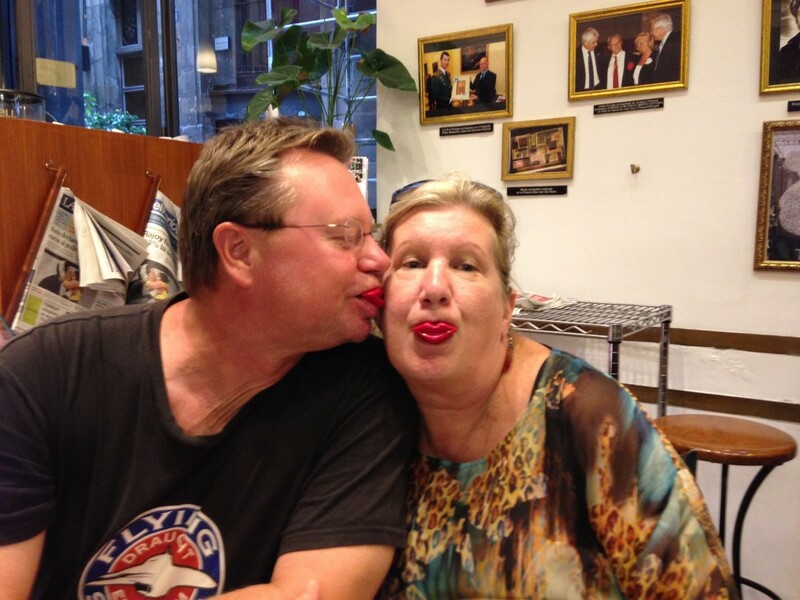 Loved the candy lips you and Pete had some fun with shows the light-hearted spirit of Barcelona. I love the way you have woven these two tours together Betsy. Context Travel does a really good job. I also took the Chocolate Tour and Ester was loaded with information to bring the history to life. I have taken one of their tours in Boston and learned so much about the city I’ve lived in all my adult life! Hi Alison – Yes, they certainly do a great job, don’t they? We’re looking forward to touring with Context again in Istanbul next month. I’d love to spend a tour date with them in the U.S.!